Yesterday I posted that I had worked AK4JA and that I thought he said he was running VERY low power, but my CW skills couldn't be sure. He was running 20 MILLIWATTS from a homebrew transmitter! He made note in the comments that this was a 38,750 mile per watt contact. Wow! What fun to be on the other end of Bob who was running such low power. Keep having fun Bob! Burke: Double-check with Bobby on his power. 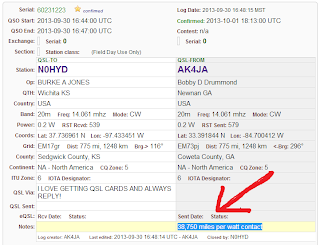 When I worked him a few weeks ago in the QRP Afield contest, he said over the air he was running 20mW. He confirmed that in a follow-up email exchange. 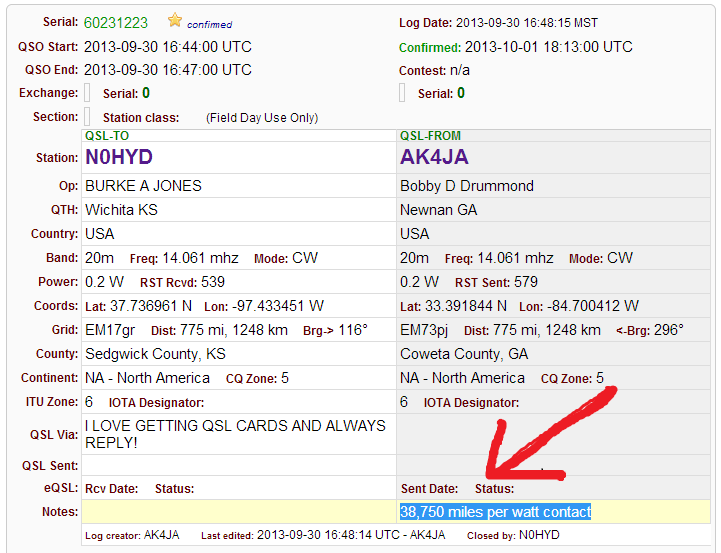 However, in the QRZ.com logbook, his power is shown as 0.2 watts. I don't know if that's a quirk in QRZ.com or what. Anyway you slice it, Bobby puts out a heck of a QRPp signal from Georgia! A BEAUTIFUL DAY.....and no coax!